DIY an Award Winning Oscars Party! You don’t have to be in Hollywood to have a glamorous Oscars celebration. 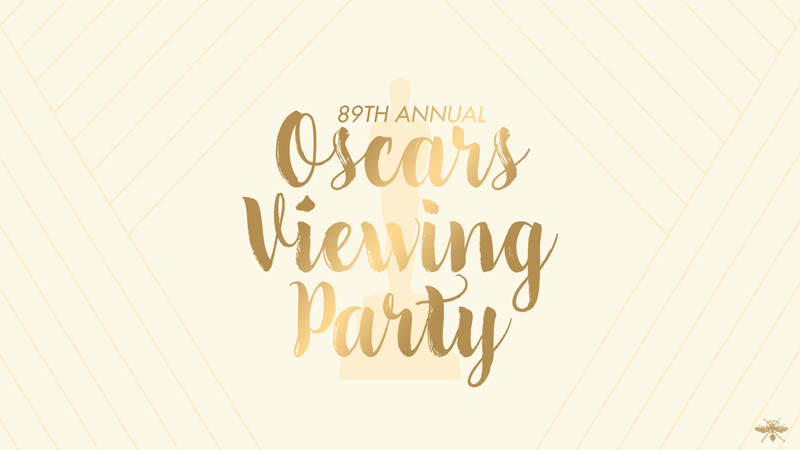 If you’re planning on watching the festivities, why not bring the fun home with an Oscar party of your own? Make the night a five star event for you and your guests by having them come as the nominees themselves! 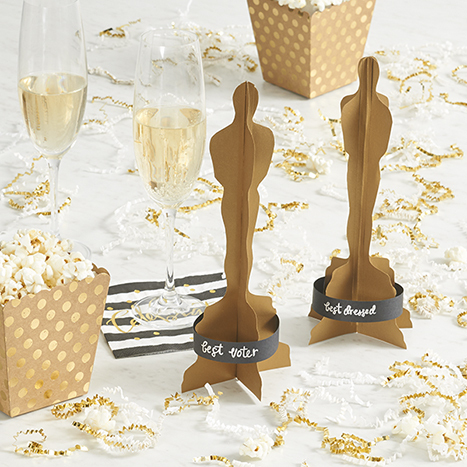 We’ve put together a collection of ideas and party essentials to help you throw a party worthy of winning its own Academy Award. 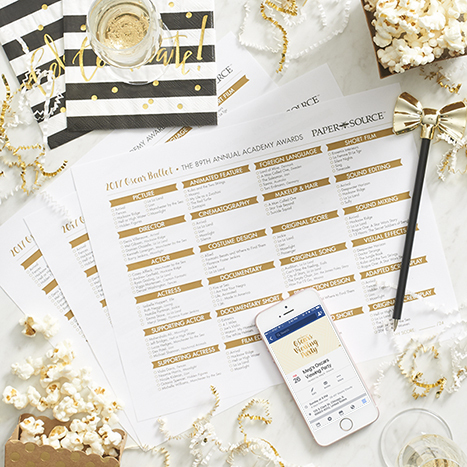 It’s not an Oscars party without a star studded list of nominations. 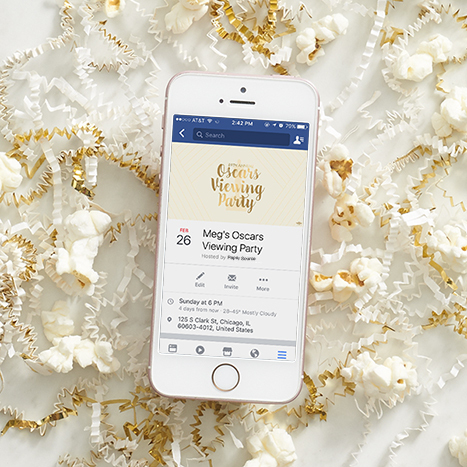 Nominate those worthy of attending your party with a fun Facebook invite. We’ve supplied you with an exclusive banner to use for your Facebook event. If you’re feeling extra festive, check out our Paper Bar to whip up your own formal invitations. Once the guests have arrived in style, the only thing they need to worry about is filling out their ballot. Add some friendly competition by awarding a prize to whoever has the most accurate ballot by the end of the night. Print out copies of our free downloadable ballot for everyone to fill out with their best guesses (or just their fave picks) in secrecy and place in a custom ballot box. To make ours, we used the Gold Big Boom on Kraft Gift Box and cut a slit into the top to allow voters to slide in their ballots. For a little decoration, we made a pennant banner using a Uniball Silver Gel Pen, Pennant Hole Punch, a 1/8″ Hole Punch, Black Paper, Black and White Washi Tape, and Black and White Baker’s Twine. Supply pens next to the box along with plenty of ballots so everyone can cast their votes. Watch the drama in real time with a live viewing of the show! Laugh together as Jimmy Kimmel roasts one or two (or ten) of the nominees, and have a shoulder to cry on during this year’s (sure to be heart wrenching) In Memoriam. Of course, you and your guests will need plenty of food to make it all the way to the Best Picture announcement, so supply them with movie popcorn and other treats! 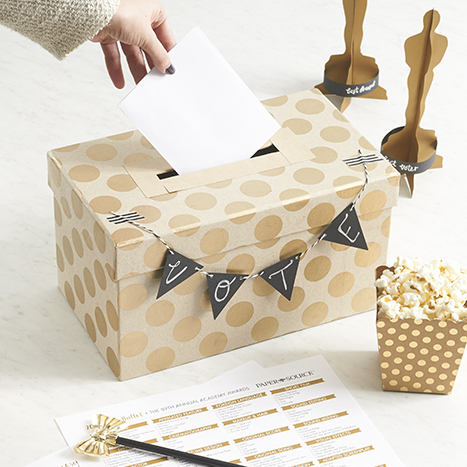 We used our Kraft Treat Boxes with Gold Foil Polka Dots for our popcorn to add a little glamour. Our Celebrate Foil Beverage Napkins are perfect for an event like this to keep your elegant coffee table free of drink stains. Once the show is over, tally up everyone’s ballots and declare the winner of this year’s Academy Award Viewing Party. Have them give an acceptance speech as you award them with their very own Oscar statue. We’ve come up with a quick and easy way to make Oscar statues to award to the winners of the night. 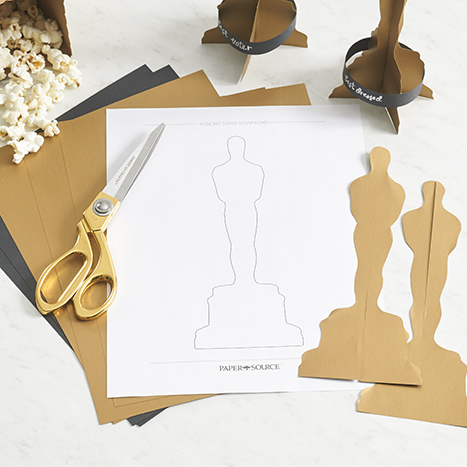 Cut out the Oscar silhouette from our free download and trace the shape over two pieces of Antique Gold paper. Cut out your two silhouettes. Next cut a slit halfway down the center of one of the silhouettes. Cut halfway up the center of the other silhouette, until reaching the point where you stopped cutting the first statue. Join the two silhouettes together at the slits to make a three dimensional statue. Use tape to secure the two pieces together. We then used a strip of gold paper to cover the tape. Cut a strip of black paper and label it with an award for the night. We used the Uniball Silver Gel Pen. Tape the black strip around the Oscar statue into a ring and you’re statue is ready! Prepare a collection of various awards to make the winning even more fun. Share your parties with us at #MyPSParty for your chance to win a Private Party at Paper Source! Loved this last year! Was a total hit at my Oscars Viewing Party! I hope this is updated for the 2018 Oscars!